Burt Rutan wants affordable space travel for the public to be a reality within 10 years. The Federal Aviation Administration announced that it gave a one-year license to Rutan's company, Scaled Composites of Mojave, Calif.
"It's one year to ensure we continue to keep pace with rapidly developing technology on this front," FAA spokesman Greg Martin told CBS Radio News. "There's tremendous potential not only from a more conventional sense in terms of transportation and what have you, but the unlimited potential that it may have for tourism," he added. Rutan is best known for designing the Voyager airplane that made the first nonstop, unrefueled flight around the world in 1986. But his dream is to inspire excitement about space flight. Though he declined to comment on obtaining the launch license, Rutan posted a statement on the company's Web site expressing his hopes that ordinary people can travel to space in 10 years. "I strongly feel that, if we are successful, our program will mark the beginning of a renaissance for manned space flight," he wrote. "This might even be similar to that wonderful time period between 1908 and 1912 when the world went from a total of ten airplane pilots to hundreds of airplane types and thousands of pilots in 39 countries. We need affordable space travel to inspire our youth." The Scaled Composites craft consists of a rocket plane, dubbed SpaceShipOne, and the White Knight, an exotic jet designed to carry it aloft for a high-altitude launch. SpaceShipOne, made of graphite and epoxy, has short wings and twin vertical tails. It reached 12.9 miles altitude in a trial flight; the license will allow the spacecraft to reach the edge of space, about 60 miles up. The license is a prerequisite for the X Prize competition, an international space race that will give $10 million to the first company or person to launch a manned craft to 62.5 miles above the Earth, and then do it again within two weeks. The craft must be able to carry three people. The prize, announced in 1996, is sponsored by the privately funded X Prize Foundation in St. Louis. Supporters include Dennis Tito, the American who spent $20 million to fly in a Russian craft as the first space tourist; pilot Erik Lindbergh, the grandson of Charles Lindbergh; former astronaut and U.S. Sen. John Glenn; and movie actor Tom Hanks. FAA spokesman Henry Price said the agency is considering two other applications for launch licenses. One is an X Prize contestant. Twenty-seven contestants from seven countries have registered for the X Prize competition. Before launching the spacecraft in the X Prize competition, Scaled Composites must give the prize sponsors 90 days notice, Price said. 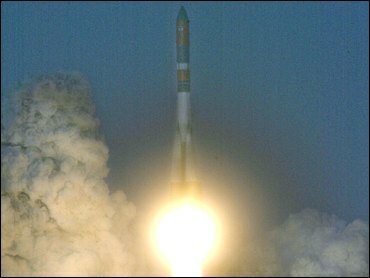 The company can launch its rocket before that, he said, but it must be in an area that isn't risky. Scaled Composites is located in the Mojave Desert. FAA inspectors carefully examined the space vehicle to make sure it's safe, said Price. "There's no sure thing in anything when it comes to rocketry," he said. "We want to do what we can with the knowledge we have to make sure the launch is as safe as possible for the public." The company also had to demonstrate that it was adequately insured for a launch and that it met environmental standards, Price said. A suborbital flight reaches space but doesn't travel fast enough or high enough to complete an orbit of the Earth.